Marsh, James H. and Tabitha Marshall. "Canada at the 1956 Olympic Winter Games". The Canadian Encyclopedia, 03 May 2018, Historica Canada. https://www.thecanadianencyclopedia.ca/en/article/canada-at-the-1956-olympic-winter-games. Accessed 25 April 2019. The 1956 Olympic Winter Games were held in Cortina d’Ampezzo, a resort town in the Dolomites, a mountain range in northeast Italy. These Games were the first to be televised and the first to be heavily subsidized by sponsors providing "official" products, such as Fiat automobiles. It was also the first time the Olympic Oath was sworn by a female athlete, alpine skier Giuliana Chenal-Minuzzo, who had won bronze in the women’s downhill event at the 1952 Olympic Winter Games in Oslo. The 1956 Games marked the debut of a team from the Soviet Union, which finished first in the overall rankings. Soviet athletes became the first non-Scandinavians to win Olympic medals in cross-country skiing and won three of four events in men’s speed skating (there were no women’s speed skating events at the time). 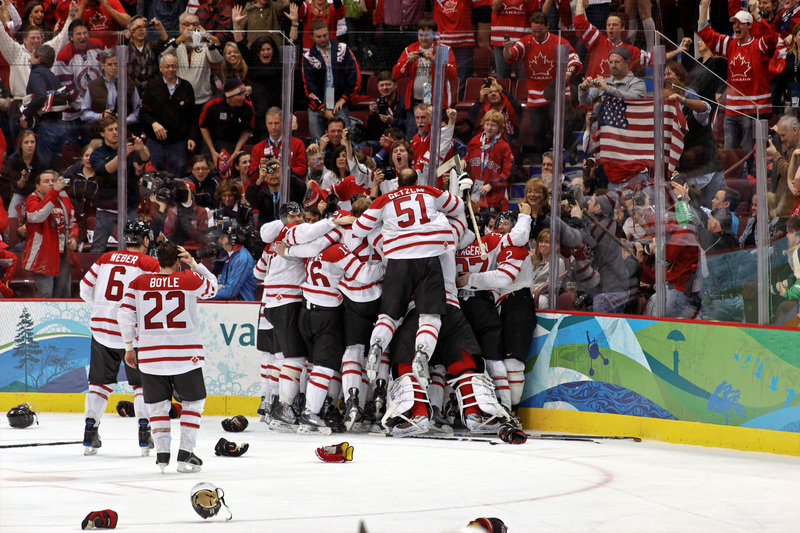 They also took the gold medal in ice hockey, ending Canada’s dominance in the sport. The Canadian team, the Kitchener-Waterloo Dutchmen, breezed through their preliminary round in the hockey competition but lost 4–1 in the medal round to the United States. CBC broadcaster Thom Benson likened the atmosphere after the loss to a funeral. “There was no joy there, no happy words, no jubilation, for last night Canadian amateur hockey suffered a blow to its prestige from which it may never recover.” On 5 February, the Canadians played the Soviet team but lost 2–0 and had to settle for bronze. This began a longstanding complaint about the rules that barred Canadian professionals from Olympic competition but overlooked the Soviet government’s support of its players, who received government jobs and trained together throughout the year. The 1956 Games also underlined the drawbacks of sending the country’s top amateur team rather than an all-star national team. “Every country with a team in the tournament was represented by a national all-star team except Canada,” said James Dunn, then president of the Canadian Amateur Hockey Association. 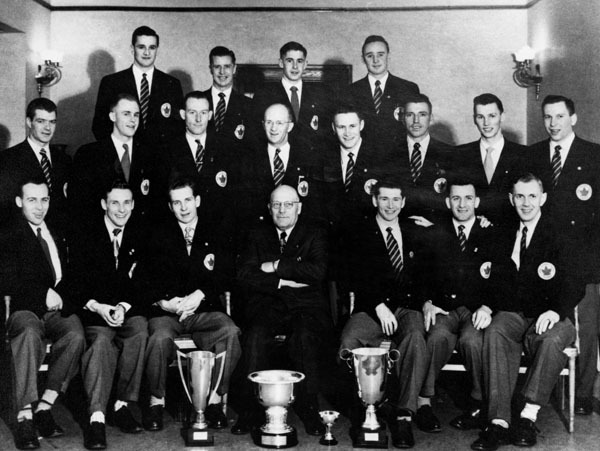 “My idea would be to make four or five players in the Allan Cup champions as the nucleus and then pack the team with the best players we could find around the country.” Bobby Bauer, who coached the Dutchmen, supported Dunn’s suggestion for a national all-star team, calling it “an absolute necessity.” However, Canada wouldn’t send a national hockey team to the Olympics until the 1964 Winter Games in Innsbruck, Austria. Canada's Lucile Wheeler participates in an alpine ski event at the 1956 Cortina D'Ampezzo Winter Olympics. Wheeler won a bronze medal in the downhill event. On 1 February 1956, Lucile Wheeler won Canada’s first skiing medal with a bronze in the downhill race. “Canadian Girl Wins Medal,” announced The Globe and Mail. Pretty Lucille [sic] Wheeler gave Canada’s followers something to cheer about today as she won Canada’s first medal for skiing in the history of the Winter Olympics. Canada’s best all-round woman skier, the freckle-faced, red-haired daredevil from St. Jovite, Que., flashed down the mile-long course on the slopes of Mount Tofana in one minute, 46 seconds to finish third in the downhill race. Besides winning a bronze medal and adding four points to the Canadian team total, she lifted some of the gloom hanging over the Canadian Olympic camp as a result of Tuesday night’s 4–1 hockey loss by Kitchener-Waterloo Dutchmen to the United States. 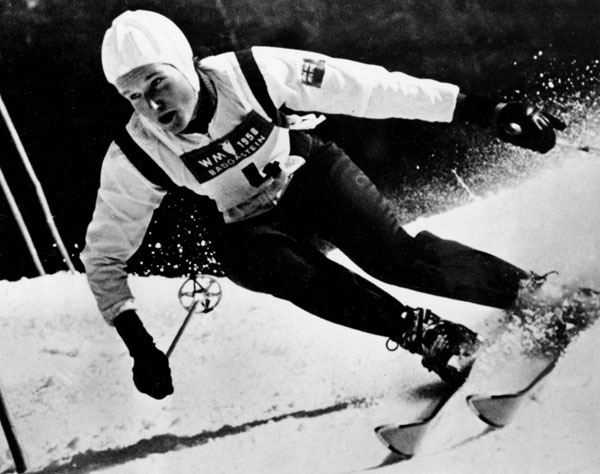 Wheeler also finished sixth in the giant slalom at the 1956 Games. Her 17-year-old teammate, Anne Heggtveit, finished well off the podium in her Olympic debut but would later win gold for Canada at the 1960 Olympic Winter Games in Squaw Valley, California. In men’s alpine skiing, Austrian Toni Sailer won all three events. The 1956 Cortina Games were the last to hold figure skating competitions outside. American skaters swept the men’s podium and won both gold and silver in the women’s competition. In pairs skating, however, it was a close contest between Canadians Frances Dafoe and Norris Bowden and Austrians Elisabeth Schwartz and Kurt Oppelt. 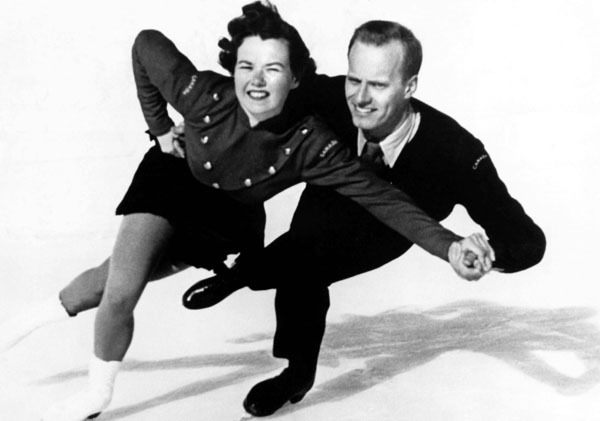 Canada's Frances Dafoe and Norris Bowden compete in a silver medal performance at the 1956 Cortina D'Ampezzo Winter Olympics. The bronze medal in pairs skating again went to Hungarian siblings Mariana and László Nagy, who had finished third in 1952. German skaters Marika Kilius and Franz Ningel finished fourth, much to the displeasure of spectators. The crowd grumbled about judging throughout the competition but became particularly incensed when the scores were announced for 12-year-old Kilius and 19-year-old Ningel, who were very popular. Spectators pelted the judges with oranges and other items, and it took 45 minutes to clear the ice before competition could resume. The second Canadian pair, 17-year-old Barbara Wagner and 18-year-old Robert Paul (future gold medallists) finished in sixth place.